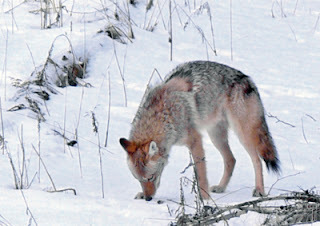 Toronto Dogs Directory: Coyotes In Stouffville...Keep An Eye On Your Pets! Coyotes In Stouffville...Keep An Eye On Your Pets! A coyote, or two, has been spotted wandering around the Hoover Park Drive and Reeve’s Way area of Stouffville over the weekend. In one incident, an area resident said it followed another woman down the street for a short while. “I’m surprised we haven’t seen more of this because we’re encroaching,” said Isabella Garden Lane resident Sean Moore, who spotted a coyote Sunday night while he was out walking his dog in the Ken Laushway Avenue and Walter Sangster area. As more urbanization takes place, coyotes have become quite comfortable being around humans. Normally, coyotes are not a threat to people. However, they will become aggressive if threatened. “Our advice to the public, regardless of where they encounter a coyote, would be not to approach it, not to feed it and if it is troublesome to citizens in the area, to contact animal control. Coyotes are wild animals, not domestic pets and they need to be treated with both caution and respect,” said Const. Blair McQuillan of York Region Police. Coyotes are drawn to places that offer easy pickings, therefore, there are a few precautions people should take. Store garbage in a sealed container and in a secure area, like a garage. Also remember that bird feeders attract birds, squirrels and rodents, which, in turn, may attract coyotes. Never leave children, small dogs or cats unattended. When out walking, avoid doing so when coyotes are most likely out — dawn and dusk. When you do go out, carry a noise maker — a whistle, air horn, bell; bring a flashlight as the bright light can deter a coyote; have your dog on a leash; make yourself appear larger and ensure the coyote sees you as a person, not his next meal. Do not bother yelling as coyotes have become accustom to people’s voices, therefore, yelling will not likely deter them. If you are concerned about coyotes in your neighbourhood, contact the Ministry of Natural Resources at 1-800-667-1940. You can also report sightings to Town of Whitchurch-Stouffville bylaw staff, however, according to senior bylaw officer Nancy Cronsberry, town officers can only enforce municipal bylaws and they only deal with domestic animals.